By Lilly Maier on Friday, October 4th, 2013 at 4:22 p.m. This post on the Facebook page of HealthCare.gov, detailing a man's struggles with big fines for not buying insurance, went viral. Shortly after the the Obamacare insurance marketplace launched on Oct. 1, users of social media experienced a burst of complaints on Twitter and Facebook, ranging from technical glitches to substantive concerns. But for our readers, one post stood out. Many readers sent us a Facebook post that went viral and has since been circulated by chain-email. It was originally posted on the Facebook page of Healthcare.gov, the federal government’s portal to the new insurance marketplace created under President Barack Obama’s health care law. The marketplace is designed to offer one-stop shopping for health insurance plans for Americans whose employers do not offer coverage. The Facebook post claims to be from a man named Will Sheehan. (We couldn’t confirm his identity.) 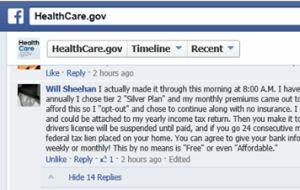 The post says that he tried to sign up for Obamacare and then decided to not go along with it; he then said he received an email detailing fines he would face. "I actually made it through this morning at 8:00 A.M. I have a preexisting condition (Type 1 Diabetes) and my income base was 45K-55K annually I chose tier 2 ‘Silver Plan’ and my monthly premiums came out to $597.00 with $13,988 yearly deductible!!! There is NO POSSIBLE way that I can afford this so I ‘opt-out’ and chose to continue along with no insurance. I received an email tonight at 5:00 P.M. informing me that my fine would be $4,037 and could be attached to my yearly income tax return. Then you make it to the ‘REPERCUSSIONS PORTION’ for ‘non-payment’ of yearly fine. First, your drivers license will be suspended until paid, and if you go 24 consecutive months with ‘Non-Payment’ and you happen to be a home owner, you will have a federal tax lien placed on your home. You can agree to give your bank information so that they can easy ‘Automatically withdraw’ your ‘penalties’ weekly, bi-weekly or monthly! This by no means is ‘Free’ or even ‘Affordable’." We will check a number of the post’s claims below. • "There is NO POSSIBLE way that I can afford this so I ‘opt-out’ and chose to continue along with no insurance." According to a spokesman for the Centers for Medicare and Medicaid Services, the agency that runs the marketplace, this is not how the system works: "There's no way for people to complete the online application and then affirmatively ‘opt out’ at the end. They would simply close the website or not enroll in a plan." • "I received an email tonight at 5:00 P.M. informing me" about the fines I would face. This is wrong on several levels. First, the system would not send any user an email if they failed to complete an application. Second, any fines would be calculated as part of the user’s overall income tax form 1040 -- they wouldn’t be sent as a bill. And third, any taxes would be owed by April 15, 2015 -- a year and a half from now. Someone being assessed a tax penalty by the Internal Revenue Service in early October doesn’t even make any sense, since the applicant has many weeks to find another insurance plan and avoid a penalty. • "My fine would be $4,037." This number is way out of line. Under the law, the penalty fee in 2014 is 1 percent of your yearly income or $95 per person for the year, whichever is higher. The fee increases every year. In 2016 it is 2.5 percent of income or $695 per person, whichever is higher. If we are to take this Facebook user’s claims at face value -- that his "income base was 45K-55K annually"-- and if he has no dependents, he would not have to pay any more than $550, by 2015. To pay a penalty of $4,037 in 2014, you would need to be making making more than $403,700 a year. • "Your drivers license will be suspended until paid." CMS told PolitiFact that nobody’s driver's license will be suspended as a noncompliance penalty under the Affordable Care Act. Nothing in the law mentions that as a penalty, and driver’s licenses are administered by state governments. • "If you go 24 consecutive months with ‘Non-Payment’ and you happen to be a home owner, you will have a federal tax lien placed on your home." A Treasury Department spokesperson confirmed that the law specifically bars the IRS from using their normal means of collecting unpaid taxes, including the use of liens and levy. Instead, the only thing the IRS can do to collect fines is to subtract it from any tax refund you qualify for. If you aren’t due a refund, all the IRS can do is send you a letter. Another section of the health care law protects citizens from any other form of punishment. "In the case of any failure by a taxpayer to timely pay any penalty (…) such taxpayer shall not be subject to any criminal prosecution or penalty," it says. • "You can agree to give your bank information so that they can easy ‘Automatically withdraw’ your ‘penalties’ weekly, bi-weekly or monthly!" Don’t take online banking advice from a Facebook post. The Treasury Department warns citizens not to hand out bank information online. The post includes many elements that make no sense or are flat-out wrong -- and can be easily debunked by reading the law or reliable summaries of it. We rate it Pants on Fire. Published: Friday, October 4th, 2013 at 4:22 p.m.
Screenshot of Will Sheehan’s Facebook Post, accessed Oct. 3, 2013.